There have been many articles flying around the internet (pun intended) about airlines placing restrictions on - or even banning - children from certain flights. ---> See: "Families feel the squeeze as more airlines adopt kid-free zones"
As a mother of 3 kids who travels frequently for my son's medical care and to visit out of town family, I have a pretty strong opinion about this. Flying is a service that is offered and frankly everyone has a right to use that service to get from here to there. 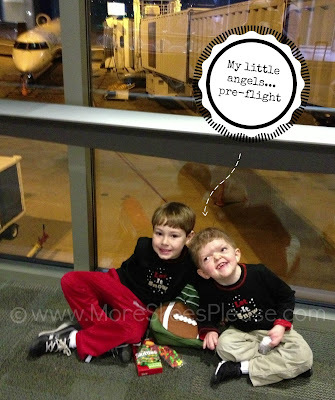 As a mom who has flown countless times with all 3 of my kids, I wish my fellow passengers knew that I'm already stressed enough from carrying the extra load and maneuvering the airport with my entire family in tow - I don't want (nor do I deserve) to have others giving me the stink-eye if my kids aren't perfect angels from take-off to touch-down. Besides - I have been on several flights where adult passengers were far more annoying than a wriggly or crying baby. I once flew 4 hours straight next to someone who decided wearing deodorant was not necessary. This particular someone - and all those around him - would have greatly benefited from a better personal hygiene routine. Another time I had to share the air with a grown man who spent the.entire.flight hacking up a lung. Or how about the woman who CLIPPED HER FINGERNAILS right next to me, then proceeded to brush the clippings onto the floor. And finally, I almost vomited as a bald man in the seat in front of me scratched and picked at small scabs on his scalp for 20 minutes straight. When it becomes acceptable for airlines to designate seating for those with improper personal hygiene choices then maybe that's when I'll care if my noisy baby is a nuisance. To all the grumpy elders and crabby businessmen who cringe when I sit next to them with my brood I say this: Look, I get it. On the rare occasion that I get to fly kid-free, I admit to rolling my eyes a bit at the irony of being seated next to a mom with baby. But I paid for my seat just like you. And while I am a damn good mom with generally pretty well-behaved kids, sometimes they turn into ten shades of crazy when the cabin door is pulled shut. Don't worry, I'm not saying I'm gonna let my misbehaving kids run rampant down the aisles or kick your seat with reckless abandon. I will do my absolute best to keep them - and you - happy. However if you are looking for a guaranteed quiet and relaxing atmosphere, perhaps flying isn't the best mode of transportation. Or maybe they should fly first class if they want peace and quiet. It is amazing that people expect children to act like little silent robots when stepping outside the house. I really doubt children acted like silent little robots a generation or two ago either. And now with airlines slashing available flights, it is really hard to find an plane tickets for a family at a good price, so to limit the tickets available to families is really crappy, imo. Luckily no US airlines are doing this... yet. The only time we had problems was when the airlines messed up: grounded us on the tarmac for 1-2 hours without moving and expecting us to remain seated--torture for a toddler. I'd think with electronic devices and cell phones so useful these days for distraction, airlines would be better to finally eliminate the "no electronic devices" upon take off and landing. We consider planes and long car rides open season on these devices and impose zero restrictions--only the ones forced upon us. That being said, there is nothing, absolutely nothing, that can be done if a child (or adult) has an ear infection and happens to be stuck on a plane. And passing out free deodorant samples instead of peanuts would make so many other people happy. GOOD FOR YOU, Taryn. I agree 100%, and as a frequent flyer and mom, I have definitely seen adults acting worse than kids. Snoring, talking my ear off, you name it.